You know the saying “More Ideas than Time“? Yeah, that’s my life. I’ve had the idea to add a Doctor Who / Police Box ribbon to this blue wool hat since November 2015. I finally finished it this weekend, 2 years and 8 months later. I’m super excited to debut all 5 for Christmas 2017, but this one is extra timey-wimey in anticipation of the 13th Doctor! Spend every year in delicious anticipation the Doctor Who Christmas special with this TARDIS Advent / countdown calendar. Fill each pocket with your favorite hard candy or a Hershey’s kiss and count down the days until the premiere! Order today and your pink Tardis quilt will ship in time for the 2017 Doctor Who Christmas special. I didn’t care because I’m so freaking excited for a female Doctor! I’ve actually seen Jodie Whittaker in Broadchurch. She’s really good. There’s 163 days until the Christmas special when the new Doctor will make her debut. 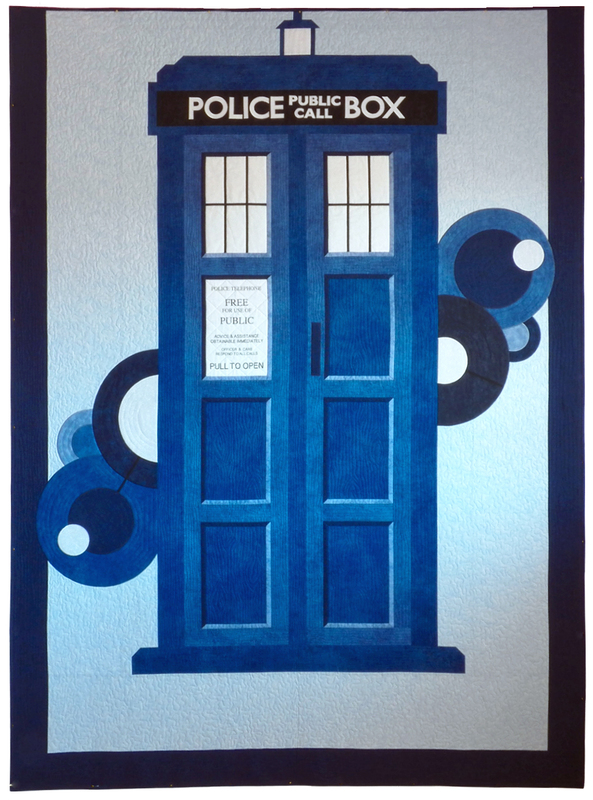 That’s plenty of time to have a custom pink Tardis quilt – or traditional blue Tardis quilt – made by Whimzie Quiltz. Contact me at deidre [at] whimziequiltz.com to get yours started today! In 2014, I created a Doctor Who quilt for a customer called “Warmer on the Inside” featuring a large Tardis on a Gallifreyan script background. A fan of the show myself, I loved every stitch on that quilt and as the time to ship the finished piece grew near, making a Doctor Who quilt for just for me became my next goal/slash/obsession. Each quilt I make is unique, so I didn’t want to just repeat the same Police Box design. I began looking for inspiration to create my own Doctor Who quilt, looking through lots of fan art online. Fortunately in my quest, I came across this cross-stitched bookmark created by DaleksTeahouse. Her clever disappearing Tardis pattern was perfect – having already made one giant Tardis in fabric, I knew making multiple smaller ones would be a fantastic challenge. And who doesn’t wish they could hear the “vworp vworp” of the Tardis engines coming for them just once? “Out of the Blue” was finished just in time for the 2015 Christmas special, The Husbands of River Song. At 60″ x 75″, it’s a mixture of machine appliqué in the letters and piecework in the Tardii and background. I chose four marbled blue fabrics to provide the gradation of color and lots of white-on-white prints to give the background depth and (relative) dimension. Deciding the appropriate quilting took a long time, but ultimately I ended up with an all over swirl that seems very timey wimey (you can see it a little better in the close-up image to the right.) The letters are echo-quilted and each Tardis is stitched-in-the-ditch to emphasize the various police box elements. I wanted a very special backing for this quilt. 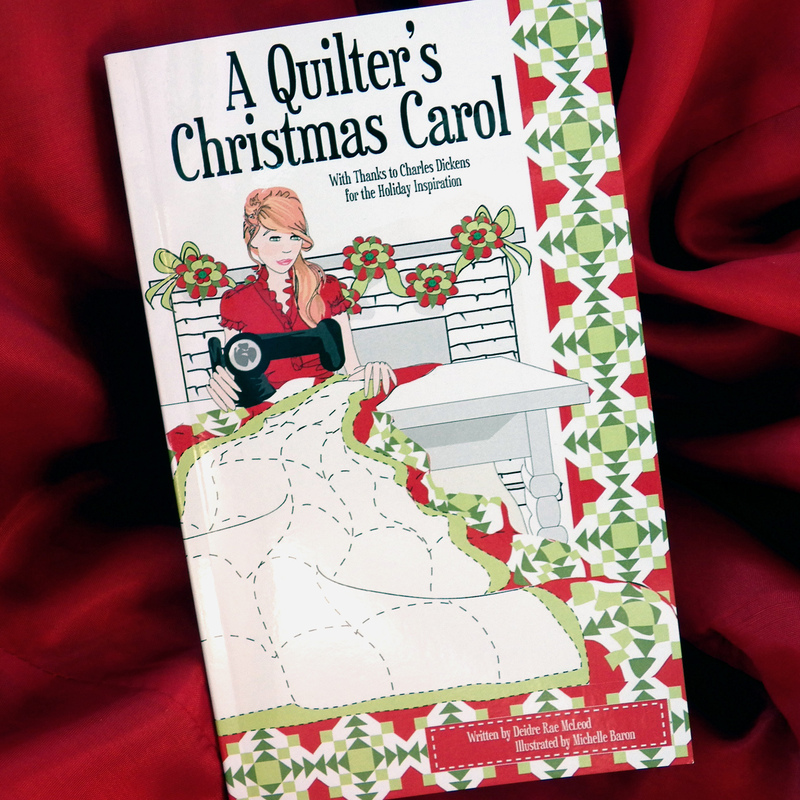 Luckily, I came across a quilt shop owner designing her own line of time travel-inspired material. The back is from Scarlett Wells’ “Through Time and Space” line from Anthology Fabrics. I can’t thank her enough for letting me know when the fabric was going to be re-released so I could snap some up! If I could go back in time, I wouldn’t do anything different, except maybe finish this quilt sooner. If I could go forward in time, I’d love to see myself curled up with this quilt, watching new Doctor Who adventures, years and years in the future. 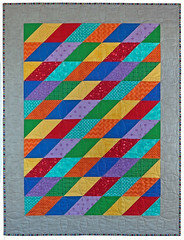 When I finished, I shared a photo of this quilt with Sarah over at DaleksTeahouse. This is her lovely reply – Doctor Who fans are the best! Thanks so much for sharing that with me! I’m really happy and flattered to know that I inspired someone to make something awesome. I love the way this looks. 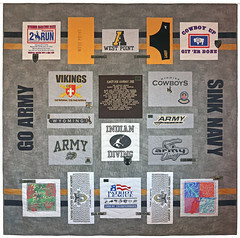 I don’t see quilts very often, and I don’t know the first thing about making them, so this is really neat! I hope it keeps you warm through many future episodes of Doctor Who. Bow ties are cool. Fezzes are cool. Know what else is cool? This just finished Doctor Who Tardis quilt for customer Melissa E.
This order actually started with a request for a Doctor Who pillow sham. Melissa contacted me to see if I’d be interested making one for her niece. If I’d be interested… um, HUGE Doctor Who fan here! I jumped on this project faster than a weeping angel can move when you blink. We decided to go for something a little different, something you wouldn’t necessarily see in all the mass marketed Doctor Who merchandise. This “I Dream in Gallifreyan” design was the result. Melissa loved the sham so much she asked me to make a coordinating Doctor Who twin quilt. I duplicated the “Gallifreyan” circles as the background and pieced the Tardis itself, using several different blues to get just the right dimension to the door panels. Not that I mind, because the reputation I’m getting is as a sci-fi quilter! 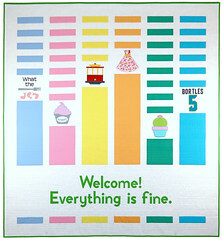 Customers seem to be coming to me more and more for quilt ideas related to their favorite pop culture icons. There was the Star Trek baby quilt from last month and I’m currently working on two Star Trek lap quilts that should finish up in September. 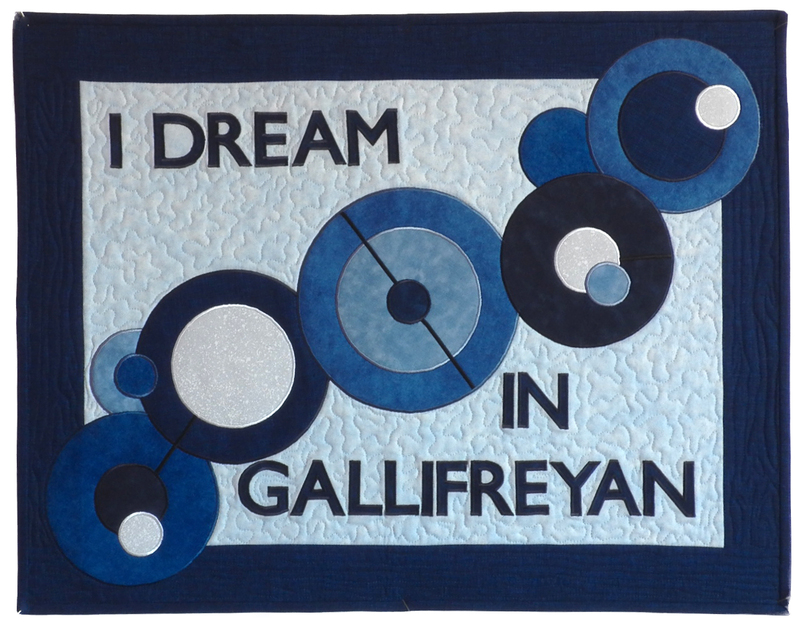 And I just got an order for a Doctor Who quilted pillow sham! (20″ x 26″; $100) The traditional Police Box design, but sized for a standard bed pillow. Pieced blue, black and white background with machine appliquéd letters. (20″ x 26″; $100) Features the Doctor Who logo and plays off the fact that Time Lords have two hearts. Machine appliqué on a striped background pieced from blues, grey and white. (20″ x 26″; $100) A great choice if you want to scare yourself silly every night before bed! Black and grey pieced background with machine appliquéd weeping angel and letters.